Working in an integrated agency, the team at Ignite PR & Marketing are more than ‘just’ PRs. We have to be able to offer our clients the whole she-bang and recently I’ve been working closely with one client to redevelop their website. Working in an agency you will always learn along the way. Collecting skills as you develop in your role. One thing I’m eagerly learning more about, but am by no means a pro at, is web design. For this particular client project I have been working with a local Brisbane web design agency to bring the client’s website to life again. Following lengthy conversations with my client we were able to form a very definite idea about how the new website should look – from the colours, messages conveyed and the site’s navigation. And this is where I introduce the wire frame. This visual guide has been a god send and is, I believe, one of the simplest ways for a project / account manager and designer to work together effectively and without butting heads ! Sometimes in an integrated agency we fall into the trap of thinking we can do it all. We become generalists not specialists. This isn’t necessarily a bad thing, but it is important to remember to identify opportunities to learn and develop new skills. This project was one such opportunity. I’ve learnt a lot from this project about how I can better communicate my expectations and ideas and the use of a visual guide such as a wireframe is one way. It allows all parties to clearly see what is being proposed and provides a point for discussion and collaboration. As a person driven by visual identifiers it, for me, is an easier way to demonstrate to others involved how I ‘see’ a project being developed rather than writing a lengthy project brief. In collaboration between myself, the client and our web design team we have been able to present a refreshed website that combines design sensibility while checking the boxes of what the client wanted from their online presence. We’re in the process of finalising the website for an early February launch so, like an Oral B ad, I cannot show you it just yet. 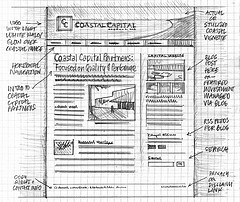 In the mean time, check out some wireframe inspiration here.